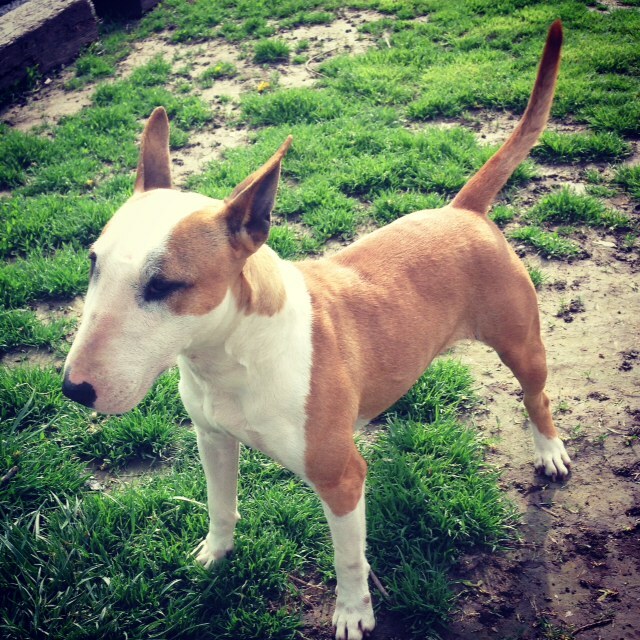 Reba is a pretty red and white Bull Terrier, very well behaved and sweet. Reba, a handsome specimen, bounced around like a rabbit. Oh my dog, y’all. I don’t think I’d ever seen a Bull Terrier in person, live and playing with kids. I met her in order to give her a Jampacked Jawzer, but wound up giving it to the owner to give her later. That’s part of tomorrow’s story. She doesn’t have time or attention for me. It seems someone somewhere has thrown a ball. Isn’t she gorgeous?! I was bowled over by her beauty and good humor. If it weren’t for the story I’ll be telling y’all tomorrow, I might have started searching online for Bull Terriers in my area. Seriously. Look at that FACE! Is she not the most adorable dog EVER?! Yes, Reba is kinda scary looking, being a very muscular, medium sized dog. I think, too, that we’ve been trained to be nervous around this breed. But she jumped and played like one of the kids. It was the funniest thing to watch. I would have loved on her more, but she was too busy playing. And she had no aggression toward me. I think, in large part, because her owner brought her out to meet me, rather than sending her out to meet me. She is a well trained dog. This stance is amazing. Feet firmly planted, Reba is ready for anything. 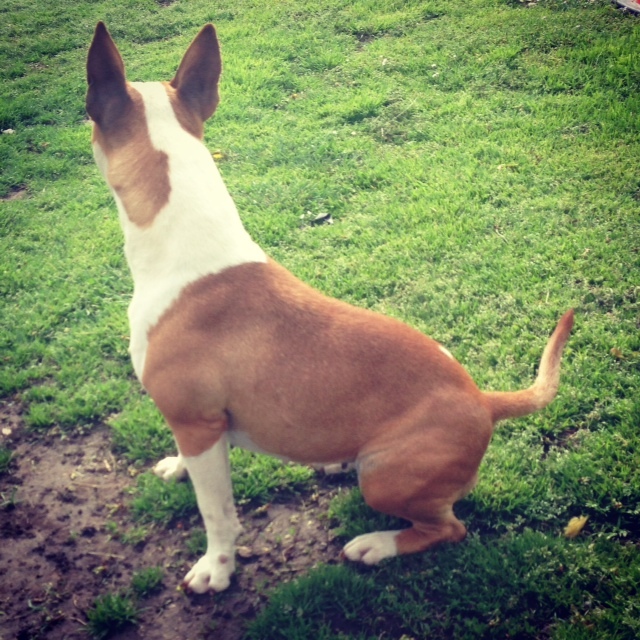 Once upon a time, Bull Terriers were bred to be ferocious defenders of home and family. This dog has earned respect. Nowadays, however, the Bull Terrier is a family dog, loyal and fun-loving. Don’t let that lull you, as owner, into a false sense of security, though. The breed still needs plenty of socialization and a firm pack leader, or it will be too loyal and protective. Not only does the Bull Terrier need good socialization, it needs people. This is not a dog which can be left home all day while its owner goes to work. Bull Terriers need plenty of physical and mental exercise, as well as an owner who can be home with it, or take it to work daily. 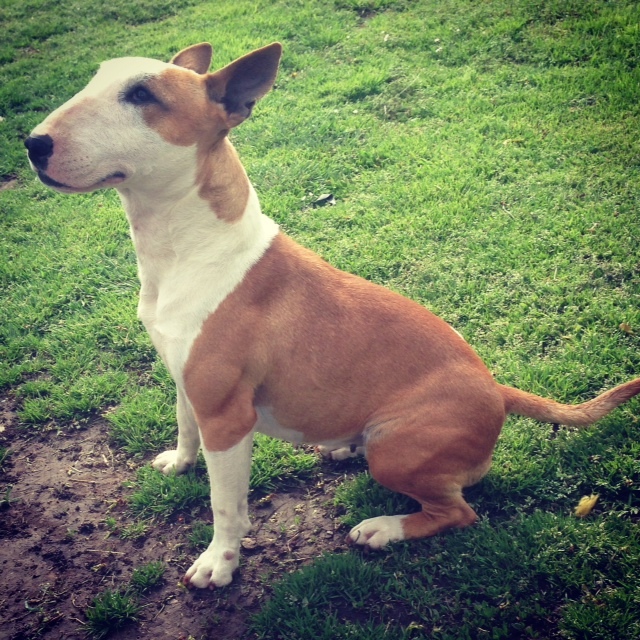 Children in a home with a Bull Terrier need to learn to be pack leaders, not timid. I’ve known plenty of little kids who are pack leaders, so don’t let this be a deterrent. Kids come by bossiness naturally. Just know that it’s an imperative if you wish to have a Bull Terrier with your kids. The Bull Terrier is not a breed for all people. It’s not a breed for families with small children who are easily bowled over and stepped on, as the dog is exuberant. It’s not a malicious thing, but a bouncy, playful thing. I watched Reba take out a three year old who was between her and the tennis ball being thrown. And I laughed and laughed. My own dogs have done that with my kids when they were little. 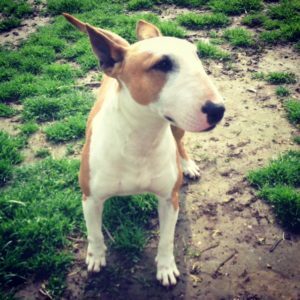 I hope if you are considering a Bull Terrier for your family that this helps. If you are timid, reluctant, retiring, this is not the dog for you. Just a glimpse into tomorrow’s story? Reba’s buddy, Frankie, was given a Jones Hoof. 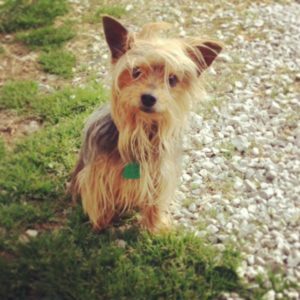 He’s a spunky little fellow and a cute example of his breed. 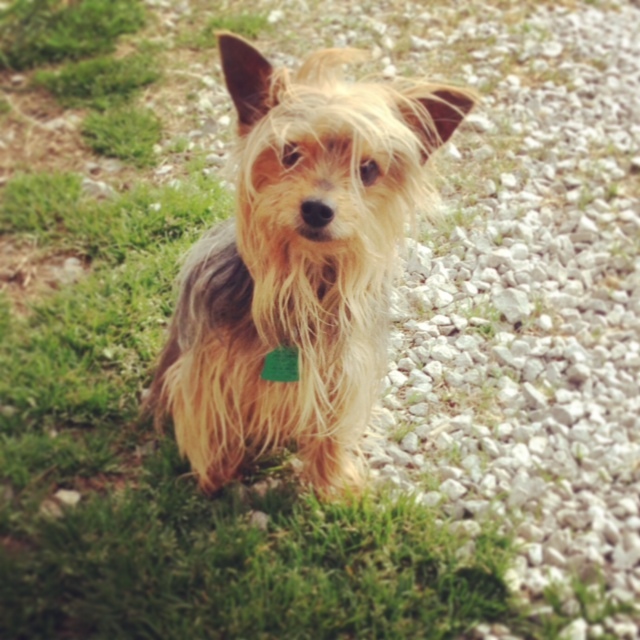 Another terrier, the Yorkie, Frankie, is nothing like the Bull Terrier. Also, Petey has become very bitey. It hurts. 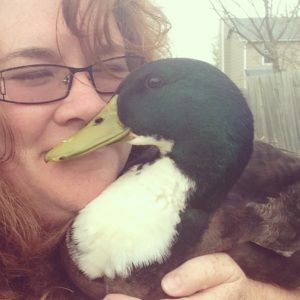 I think it’s a young male thing with ducks. His father, Jimmy, was hurtful when he was this age. Now Jim nibbles my hands without hurting me, but Petey tries to take flesh when he bites. This is what I do to make him stop. I pick him up. Petey HATES being picked up. He doesn’t bite me for a few minutes after I put him down. I don’t mind when he bites my hands, but the sneak attacks on my ankles really hurt. Y’all have a great wordy Wednesday!